The Teclast Aurora A900 is a decent budget SSD that gives you good speeds and plenty of storage space for the price. If you see one while shopping for an SSD, then it’s worth considering. Solid state drives (SSDs) that use the ageing SATA III connection of your motherboard have mainly reached the limit of how fast that connection can handle data, so is it worth going for a cheaper SSD from a brand you may not have heard of, instead of more established brands like Samsung? 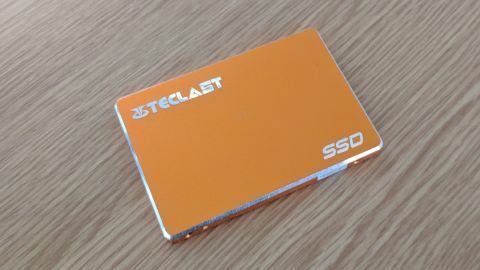 Teclast is a name you probably aren't too familiar with, but if it can produce an SSD that hits the peak of what SATA III connections are capable of, should you consider it? We’ve got the Teclast Aurora A900 (480GB) SSD in for review, which promises very good speeds of up to 520MB/s read and 450MB/s write, while costing around $115 (about £60 / AU$150) from the company's Alibaba store. We say 'costing around', as the Teclast Aurora A900 (480GB) SSD can be difficult to track down and buy; however, it costs a lot less than the Samsung 860 Pro, which is one of the best SATA III SSDs on the market, and it promises around the same level of performance. The Teclast Aurora A900 is a nice-looking SSD, finished in a bright orange that Teclast calls ‘personality colors’. Of course, with it being an internal SSD you don’t really need to worry too much about what it looks like, unless you have a fancy gaming rig with a large window on the side to show off your hardware, but at least it looks like a quality product, and it feels sturdy as well. As we've mentioned, it’s advertised as having speeds of up to 520MB/s read and 450MB/s write, which is at the upper end of what SATA III drives can manage. However, it’s not just speed that you need to consider when buying a hard drive, especially one from a brand you may not be familiar with. You also want to be sure the drive is well-built and dependable, as you don’t want to lose any of your important files if it breaks. Teclast promises that its drives are subjected to strict tests that last more than 80 hours, and that they're inspected to ensure there are no faults or problems before they're shipped. These tests include 48 hours of continuous reading and writing, booting a machine with it installed 250 times, and high and low temperature tests. This should give you some confidence that the Teclast Aurora A900 is a dependable drive. However, many SSD makers provide mean time between failures (MTBF) statistics, which gives you an idea of how reliable a drive is. As far as we can see, Teclast doesn't provide these. Home users should be happy enough with the reliability promised and the tests Teclast performs, but if you’re a business user who requires a drive that will be in constant use you may feel more comfortable going with a more established brand. The Teclast Aurora A900 sent to us for review has a capacity of 480GB, which is a good amount for an SSD these days, giving you plenty of space to install an operating system while also giving you enough room to install programs and games, but if you need more space there's also 960GB model. In the CrystalDiskMark benchmark the Teclast Aurora A900 scored 495MB/s sequential read and 457MB/s write. This is pretty close to what Teclast promised, though not as fast as the more expensive Samsung 860 Pro, which hits 562.9MB/s read and 532.7MB/s write; it’s also slower than the HP S700 Pro SSD, which managed 562.3MB/s read and 509MB/s write. The ATTO Benchmark produced similar results – so the Teclast Aurora A900 is far from being the fastest SATA III SSD we’ve tried, but due to its budget price we weren't expecting to be blown away. Plus, it’s still a lot faster than a traditional hard drive, so you will experience a boost in performance if you’re upgrading from an older drive. If you’re looking to give your laptop or PC an affordable speed boost by installing an SSD then the Teclast Aurora A900 is a decent choice, as it offers good speeds and a useful amount of capacity for a relatively modest price. However, if you want the very fastest SSD, or you need a drive for a server or NAS device that needs to be reliable over long periods of time, then you may feel more comfortable going for a more established brand. The Teclast Aurora A900 can also be hard to find, being available from only a few retailers, and its unremarkable performance may mean that you decide it’s not worth going to the effort of tracking one down.